This text is based on chapter 6.9 in booklet How Quality is Assured by Evolutionary Methods, see booklets page, Booklet#2. Based on the experience gained, starting with the weekly team meetings we found in most projects, we arrived at a weekly 3-step process, which proves instrumental for the success of Evo planning. In this process we minimize and optimize the time spent in the project. Selecting what to do and what not to do (we don't do things nobody is waiting for). The Project Manager also prepares for his team what he thinks are the most important Tasks, what he thinks these Tasks may take (based on his own perception of the contents of each Task and the capabilities of the Individual) and how much time he needs from every person in the Team. We iterate until we are satisfied with the set of Tasks for the next cycle, checking for real commitment. Now we have the work package for the coming cycle. We use an LCD projector at every meeting, even at the 1-to-1’s. Preferably we use a computer connected directly to the Intranet, so that we are using the actual project files. This is to ensure that we all are looking at and talking about the same things. If people scribble on their own paper, they all scribble something different. The others don’t see what you scribble and cannot correct you if you misunderstand something. If there is no projector readily available for your project: buy one! The cost of these projectors nowadays should never be an obstacle: you will recover the cost in no time. There is not just one scribe. People change place behind the computer depending on the subject or the document. If the Project Manager writes down the Task descriptions in the Task database (like the ETA tool, see figure or download), people watch more or less and easily accept what the Project Manager writes. As soon as people write down their own Task descriptions, you can see how they tune the words, really thinking of what the words mean. This enhances the commitment a lot. The Project Manager can watch and discuss if what is typed is not the same as what’s in his mind. 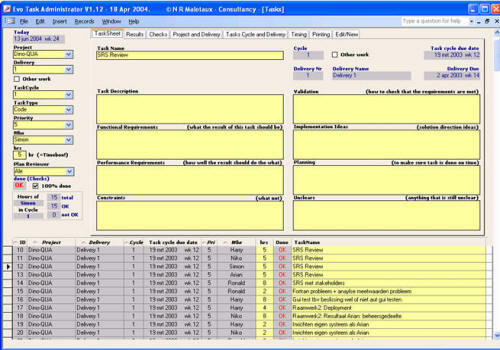 And when we are connected to the Intranet, the Task database is immediately up to date and people can even immediately print their individual Task lists. While the Tasks are listed on the projection screen (as in the figure), people read aloud their planned Tasks for the week. This leads to what we call the synergy effect: People say: "If you are going to do that, we must discuss ...", or "You can’t do that, because ..." Apparently we overlooked something. Now we can discuss what to do about it and change the plans accordingly. The gain is that we don’t together generate the plans, we only have to modulate. This saves time. If something came up at a 1-to1 which is important for the group to know, it can be discussed now. In conventional team meetings we regularly see that we discuss a lot over the first subject that pops up, leaving no time for the real important subject that happened to be mentioned later. In the Evo team meetings we select which subject is most important to discuss together. To learn and to socialize. At every step of the process we try to minimize the number of people involved. First we added the 1-to-1’s to the process. The aim was to relieve the team meeting from individual status reporting and from too detailed 1-to-1 discussions. We found, however, that these 1-to-1’s easily took about one hour each. One Project Manager said: "Niels, with 6 people in my team, I can just manage in one day. But what would you do if there are 15 people in the team? I want these meetings to take not more than 30 minutes". Watching closely what was happening in the 1-to-1’s, we saw that there was a lot of thinking and waiting: "What are you going to do the next cycle?" Pause for thinking. "What effort do you estimate for this Task?" Pause for thinking. "How much time do you have for the project this week?" "I don’t know. I have to discuss with the Project Manager of the other project". Sigh. Why didn’t you check before the meeting? Now we cannot decide! This led to the Individual Preparation step, where people prepare these issues before the meeting. The result was that the 1-to-1’s went from one hour to 20 minutes. That was much better than we expected. The reason is probably that now people come to the meeting much more prepared, so they can talk business right away. Having optimized the 1-to-1’s this way, Project Managers invariably say that these 1-to-1’s are one of the most powerful elements of the Evo planning approach. Team meetings usually take not more than 20 minutes. Do we discuss less than before? No, we just discuss the right things effectively and efficiently. Some people complain: "I'm afraid that all this planning will take way too much time. I have better things to do!" We now know how much time people actually spend for this type of planning: just 1 hr per person: 20 min for each step. Of course Project Management spends more, but shouldn't they have been doing this all along in order to save time in the project?